A novel following an American couple and their young son as they learn to survive in 1990s Budapest. Unflashy as it may seem, her writing sparkles when she alternates between detailing her characters’ motivations and describing their new home in all of its volatile, foreign, scaldingly hot charm. She demonstrates a masterly touch in the way she drops dashes of bleak Hungarian history into marital squabbles, family meals, and morning jogs. The familiar, even obvious rhythms of Strangers in Budapest mostly work to its benefit. Keener’s prose occasionally meanders, as reminders of Annie’s state-of-mind turn redundant and the Budapest sun’s overpowering heat is relentlessly emphasized, but it always clicks back into place, fusing emotion to setting and past to present with cutting brevity ... Strangers in Budapest doesn’t exoticize or patronize its location; rather, in a rare achievement for an American novel of this international emphasis, it revels in the complexity of its appeal. The more we learn about the city — the more we travel its roads, wander its stuffy apartment buildings, admire its parks and rivers — the more mournfully satisfying the book becomes. We come to understand why these characters are drawn to Budapest. We see why they’re drawn to the dead. Keener expertly weaves together a story that not only showcases an expat life, but also shares the tragedies, memories and grudges of strangers in a beautiful city who are more connected than they have come to believe. 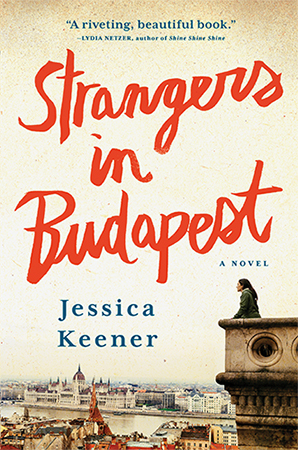 Keener’s attempt to bring together her unsettling year-long experience living in Budapest with a fictional mystery surrounding the death of a WWII veteran’s daughter is a promising—if not entirely successful—framework for this rather slow-moving novel ... Keener’s writing is unquestionably skillful. Her ability to render multidimensional characters through sophisticated description and dialogue is excellent. But the buildup to the novel’s climax and revelation of the so-called mystery of Deborah’s death is paced too slowly. Ultimately, it is overly ponderous, perhaps as a result of one too many themes intersecting clumsily in the novel, stalling its momentum and diluting its suspense. What did you think of Strangers in Budapest?